**180g vinyl. Limited edition of 500. Includes a large format 8-page full-colour booklet of Bruno S' drawings & paintings** "He was the best. There is no one who comes close to him. I mean in his humanity, and the depth of his performance, there is no one like him." 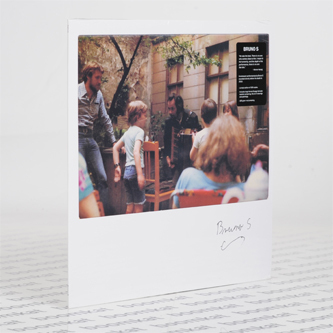 -Werner Herzog on Bruno S. These exclusive recordings of Bruno S' music were made in Berlin in 2009 shortly before his untimely death at the age of 78. They capture perfectly his distinctive voice, accompanied by accordion and glockenspiel, in the places where he performed for many years - the streets of Berlin, a local tavern, and his own apartment. Bruno S was a street musician and painter who first came to public attention through the two films he starred in for director Werner Herzog, The Enigma of Kasper Hauser (1974) and Stroszek (1977), a film that in some part was based on Bruno's own life. He was born in 1932, likely in Berlin, to a prostitute who placed him in a mental hospital as a child, where he was subjected to Nazi experiments. Bruno would go on to spend 23 years in institutions, including jails and homeless shelters. As an adult he began to perform on the street as well as working as a forklift driver, before ultimately catching Herzog's eye. The common themes of Bruno's street ballads, folk songs and operettas are crime, abandonment, passion, and, perhaps most significantly, the role of the mother. In dealing with his troubled life, Bruno pulled himself out of isolation through his art, at first through music, and later also through his paintings and drawings. This beautiful record is pressed on 180 gram audiophile vinyl and features a large format full-color booklet containing lyrics, liner-notes and reproductions of several of Bruno's paintings and drawings."